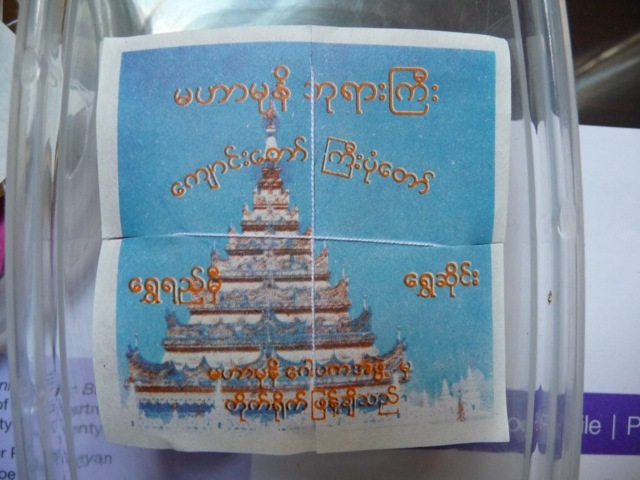 We visited Myanmar (Burma) several years ago. As an unpopular tourist destination, we saw the country before it is over-run and spoiled by too many tourists. The country was pristine, the people friendly, and the tourist sights were devoid of crowds. We visited during their water festival. The sensuous dance by this lovely woman on a parade float left a deep impression. As a Buddhist country, people revere temples and Buddha’s images. 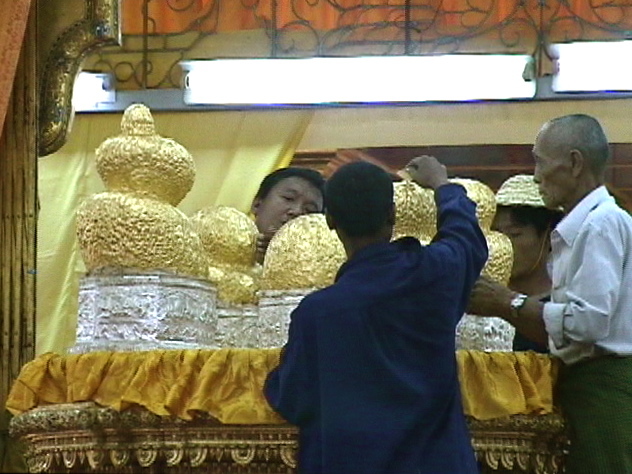 The devout would pay their homage by pasting gold foils onto the images of Buddha. These five images in a popular temple had been pasted by so many layers of gold foil they became globs of gold. They are said to weight a hundred pounds each. To supply the devout with gold foil, an industry of manufacturing gold foils thrived. 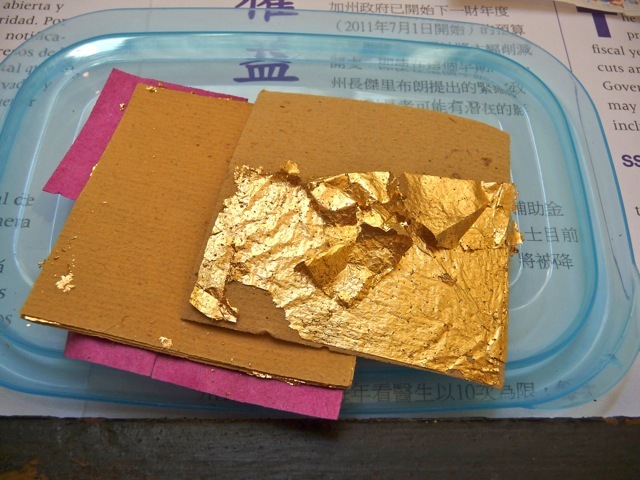 The traditional method required repeated beating of layers of gold between sheets of paper for hours. A package of 100 sheets of gold foil, 2″ x 2″, costed about $10. The gold foil is extremely thin. A sneeze would blow it across the room. 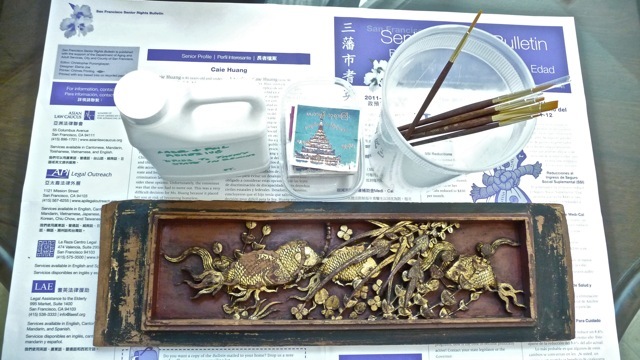 When we were living in Guangzhou (廣州), I roamed the antique markets and bought some items. 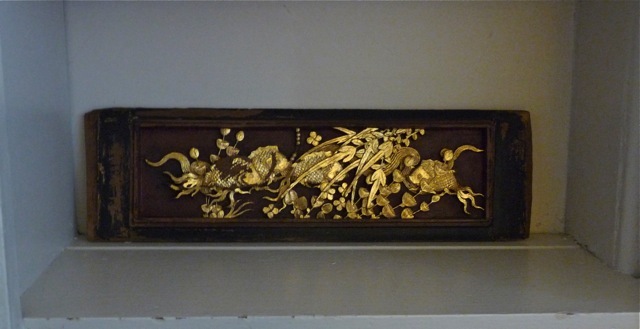 This carved wood panel was gilded with gold, but has lost its luster from exposure and time. 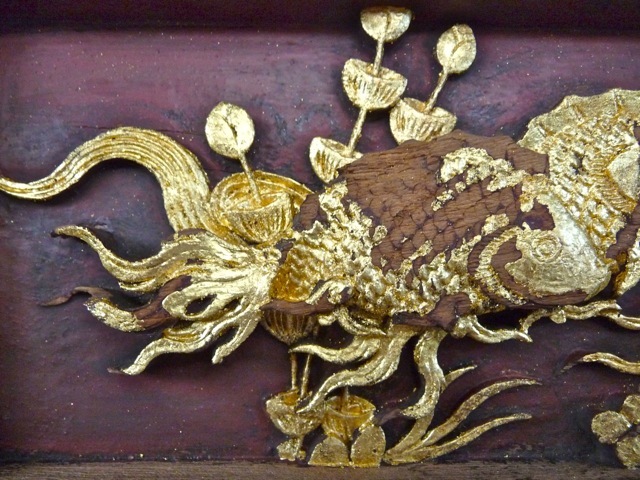 Recently, I decided to restore the gold gilding. I assembled the ater-based adhesive for gilding metal foils, gold foils, brushes, and the panel. 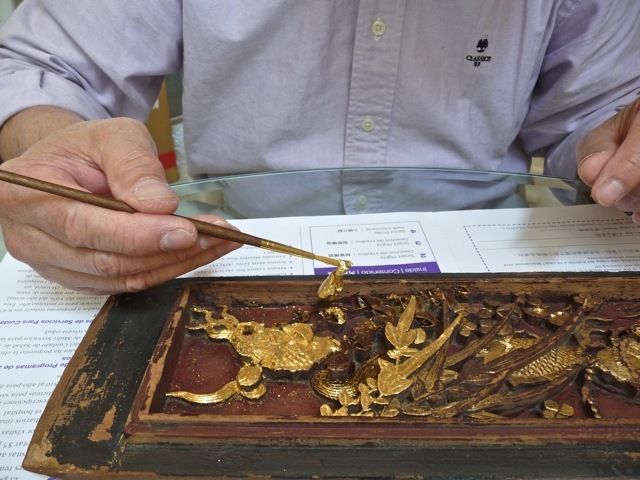 First, a fine brush is used to carefully paint the adhesive to a small area to be gilded. Allow 20 minutes for the adhesive to dry to a tacky film. 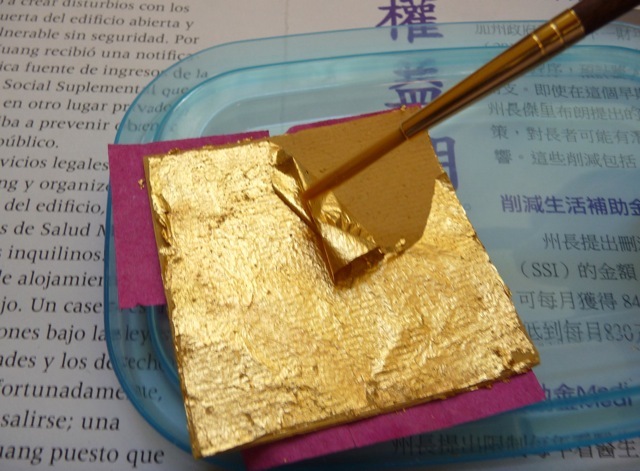 A soft brush is used to lift the delicate gold foil. The foil is carefully placed onto the tacky surface, to which the foil readily adheres. 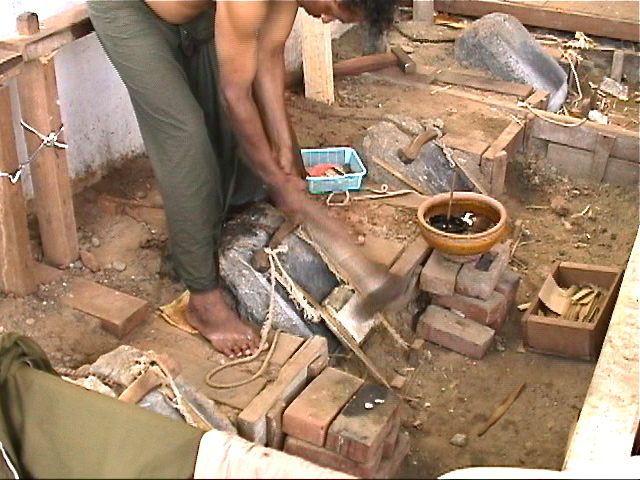 The brush is used to burnish the surface and remove excess gold speckles. The panel is 1/3 finished. The panel is 2/3 finished. To retain the time worn patina of the antique panel, damaged surfaces are left untouched. The new gold gilding makes the panel beautiful. When placed on a darkened shelf, the gold glisten and grabs the eyeballs. Now I really appreciate the beauty and the attraction of gold. But gold can easily overwhelm the senses if used too extensively, and I can overdose if I see a roomful of gold. It is best used judiciously as accent and focal point. Posted by Robert Wu on Thursday, July 7, 2011, at 10:36 pm. Filed under Uncategorized. Follow any responses to this post with its comments RSS feed. You can post a comment or trackback from your blog.